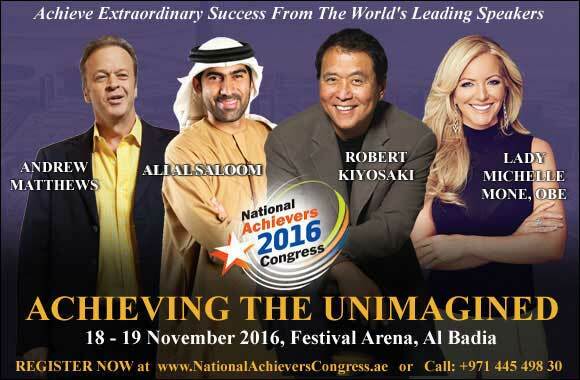 Dubai, UAE, October 18, 2016: In collaboration with Najahi and Success Resources, the leading seminar organizer in the world, the Middle East is welcoming its first National Achievers Congress 2016 on the 18th and 19th of November 2016 at Festival Arena Al Badia in Dubai. In its 23rd year, the renowned international congress brings together a line-up of outstanding global achievers and influencers to the region to pave the way for entrepreneurs. The inaugural National Achievers Congress 2016 seeks to give everyone the opportunity to achieve phenomenal results in their personal and professional lives by having some of the world’s greatest speakers empower them. Keynote speakers at the two day event include Robert Kiyosaki, Ali Al Saloom, Andrew Matthews, and Baroness Michelle Mone of Mayfair, OBE. The Congress aims to inspire attendees to pursue their dreams, invest strategically in assets, effectively manage their finances and develop essential business and leadership skills. “We’re absolutely thrilled to bring the National Achievers Congress to Middle Eastern soil especially to the UAE; a country that embraces such a strong and vital entrepreneurial spirit. This one of a kind event will boost attendees confidence to pursue what they aspire by learning from esteemed names who have taken risks and succeeded,” comments Awfa Mustafa General Manager and Co-founder of Najahi. The speakers at the event have been chosen for their ability to inspire audiences and encourage them to follow their dreams, create business and investment vehicles to support them and find fulfilment and happiness while doing so. Leading the panel of speakers is investment icon Robert Kiyosaki is the author of “Rich Dad, Poor Dad” the world’s number one and best-selling personal finance book of all time. Andrew Matthews is a best-selling author-illustrator of Happiness Now, How Life Works, and Follow Your Heart, to name a few. Other exceptional achievers featured at the Congress include international speaker and prominent Emirati business mentor Ali Al Saloom, a best-selling author, cultural consultant and highly sought after local media celebrity and Baroness Michelle Mone of Mayfair, OBE, a well-known female entrepreneur in the UK. “Event attendees can look forward to a highly diverse programme, led by Robert Kiyosaki and featuring other prominent leaders in various fields. These remarkable speakers are committed to creating and sharing insights, in addition to the most cutting-edge systems and processes of success.” Awfa added. Established in 1992, National Achievers Congress is an event that brings together the world’s top experts in business, finances, health, and personal development to speak about their success stories to inspire and empower its participants. Every year, each event offers people from all walks of life and industries across the board a platform to meet and interact with legendary business and leadership icons including Sir Richard Branson, Lord Alan Sugar, Tony Robbins, Bill Clinton, and Tony Blair. The National Achievers Congress aims to equip participants with the strategies, skills and tools to dream bigger, perform better, be more innovative, think differently and attain the lifestyle they deserve by applying what they learn. Najahi brings the world’s leading speakers in personal empowerment, financial education and leadership skills to the Middle East. Operating out of Abu Dhabi Emirates, Najahi’s aim is to spread powerful lessons of personal empowerment across the region to help people make positive and transformational changes in their lives. Success Resources is part of a global business that exists to support individuals and organizations through education. Our activities include the design, promotion and delivery of leading business and personal development seminars, programs and related products and services. At almost 100 events every year with as many as 5,000 in a single event around the globe, Success Resources has impacted the lives of hundreds of thousands from more than 35 countries. This includes Australia, China, UK, South Africa, Poland, Switzerland, Norway, Holland, Germany, Malaysia, Singapore, and for the first time now, in partnership with Najahi, the Middle East.